I wore this for a friend of mine's last night out in Miami. We went to dinner at Versailles, probably the most famous cuban restaurant in town, and then out to a local bar. I'm not a huge fan of Cuban food, but over the years I've found a few things I really like. I LOVE croquettas and Versailles didn't disappoint. The empanadas, yuca fries, and cilantro sauce were also great. My Cuban friend also said they have the best Cuban sandwich in town. 3 people at the table ordered the sandwich (myself included) but I wasn't wowed - it could just be that I had way too much ham already that day, lol. Anyway, I've been wearing my hair like this a lot recently and it is SO easy to do! The tool I use, the Conair You Curling Wand, was only $20 at Walmart. I think every hairstyle always depends on the type of hair you have, but I never thought of myself as someone who had hair that could hold a curl until I tried this tool. My hair stays curled for days -- until I wash my hair. I highly recommend trying it. Plus, it's only $20 so it's not a huge investment like some of these $100 tools on the market! On freshly washed and blow dried hair, I wrap about 1-2" sections of hair around the tool away from my face. I hold about 10-15 seconds for each strand. I curl my whole head, spray with hairspray, and then brush my hair through immediately as the hairspray is drying. I then use my hands to shape some of the curls and smooth out the hair and it turns out like this! Easy - and it only takes about 15 minutes (I don't have an extra 15 minutes during the week but I love it for weekends!). Linking up for Tara's Summer Style Linkup, and Style Elixer for Friday's Fab Favorites! This vest. Gets me every time! Love love love it! Your hair looks so good like this, Elissa! And your Loeffler Randall bag... want want want! YOUR HAIR. MY HEAD. IMMMEEEEDDDDIIIAAATTTEEELLLLYYYY. You look fantastic! And that little puppyface in the background just kills me. I love this monochrome look! Your hair looks so gorgeous! I really love your vest too! Loving this whole outfit on you! 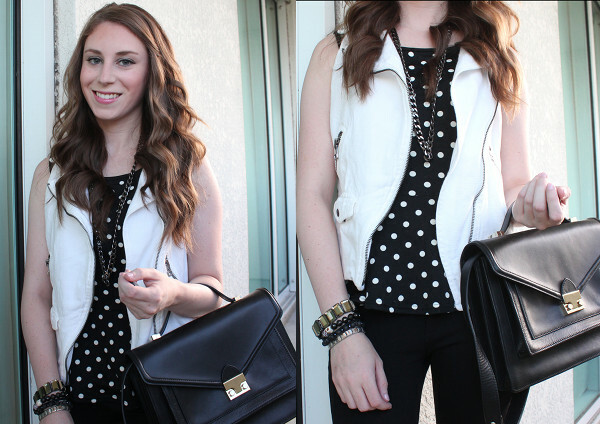 The vest and bag are so amazing, now following your blog! You look so good! And haha I love the pup in the background! I always want to curl my hair but I chicken out and am too lazy on the weekends. Maybe I'll give it a shot this weekend! Wirklich gibt sieht sehr schönes Gefühl ; ' .